To posit the significance of Osama bin Laden's demise, we must first decide which came first — the chicken or the egg? Quaint as it is, this question is fundamentally an inquiry into the nature of cause and effect. In our context, did Osama bin Laden "create" the idea of jihad, or did the centuries-old doctrine of jihad — supplemented by Koranic verses that "strike terror into the heart of infidels" (8:12) — create him? It is clear what the mainstream media would have us think. Take CNN alone; its national security analyst Peter Bergen maintains: "Killing bin Laden is the end of the war on terror. We can just sort of announce that right now." Insisting that the "iconic nature of bin Laden's persona" cannot be replaced, Bergen suggests: "It's time to move on." Another CNN analyst, Fareed Zakaria, assures us that even if politicians including President Obama aren't saying it yet (you know, "to be cautious"), "the truth is this is a huge, devastating blow to al-Qaeda, which had already been crippled by the Arab Spring. It is not an exaggeration to say that this is the end of al-Qaeda in any meaningful sense of the word." Indeed, nothing could be further from the truth. How many Muslim "charismatic leaders" and ideologues have come and gone only for the jihad to rage on? Then there is the immensely "charismatic" Ayatollah Khomeini — the original poster-boy of radical Islam, who transformed once secular Iran into a fundamentalist theocracy. Over twenty years after his death, Iran is more radical than ever, and on its way to becoming a nuclear power with eschatological visions of glorious "martyrdom." One can go on and on. For example, after Hamas' spiritual leader and founder, Sheikh Yassin, was assassinated, far from fizzling, Hamas grew in strength to the point that it now runs the Palestinian Authority. Bana, Qutb, Khomeini, and Yassin are a meager sampling of Islamist leaders that have come and gone in this century alone. Were one to go further back in time, the continuum of history would unequivocally prove the existentialist nature of the threat: "Charismatic ideologues" — like Ibn Abdul Wahhab (18th century), Ibn Taymiyya (14th century), and Ibn Hanbal (9th century) — have preached the jihad throughout the centuries; and any of these Muslim leaders would make bin Laden look like a sissy. Indeed, if one doesn't mind being labeled an "Islamophobe," one could trace jihad back to the origins of Islam in the 7th century, to the prophet Muhammad, who proclaimed: "I have been commanded to fight against people so long as they do not declare that there is no god but Allah." How terribly myopic of mainstream analysts to conclude that the death of bin Laden — of one man—can in any way, shape, or form eliminate the threat of jihad, which has a fourteen-hundred year lineage. It is a sign of the times that the media's most celebrated "experts" cannot — or will not — distinguish between cause and effect. 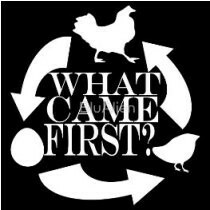 For our purposes, then, clearly the "chicken" (the cause, the idea) came first, producing many "eggs" (the effects, the believers). Even as we crack and fry up another jihadi-egg — an admittedly large one, bin Laden — the jihad-chicken runs wild, producing batches of eggs around the globe, while the establishment refuses to acknowledge its existence.